Before we begin there are a couple of things that you need to know before you proceed on reading the current article. There are generally three layers, or some may call them levels, of analysis when it comes to Ancient Greek Mythology. The first level is termed as "main-stream" which is your typical level of understanding in regards to the Ancient Greek Myths. If you just read the Myths as bedtime stories, or all that stuff that is taught in the schools and universities, even the so called Ivy League universities, or if you buy a book from your typical (online)-bookstore, the knowledge that is passed to the reader, or researcher, is nothing more than superficial. The second and third levels of analysis are the advanced ones; also known as deep-level investigations. The second level examines the hidden, or secret, messages that can be found in the Ancient Greek Myths; and the Ancient Greek Myths are packed with such mystic knowledge. At this point, some may wonder, if so why are the Myths full of such secret messages? Why was the knowledge not passed on, to the people, freely and without the smoke of secrecy? If you guys have studied, at least to some extent, Ancient Greece you should have realized that the Ancient Greek Scientists or Philosophers where, one way or another, initiated into at least one Esoteric School. Such examples are the Eleusinian Mysteries, the Kabirian Mysteries, the Pythagoreans and so forth. Regardless which “school” they all had to follow one basic rule: “To never reveal to the uninitiated ones the mysteries…”. Consequently, whenever they wanted to pass a secret to the open they used allegories; the initiated ones where able to decipher them while the uninitiated just understood these messages as “bedtime”-stories (aka today’s mainstream approach). The third level refers to astronomical manifestations. The myth of Andromeda and Perseus depicts such an instance (see pictures below). 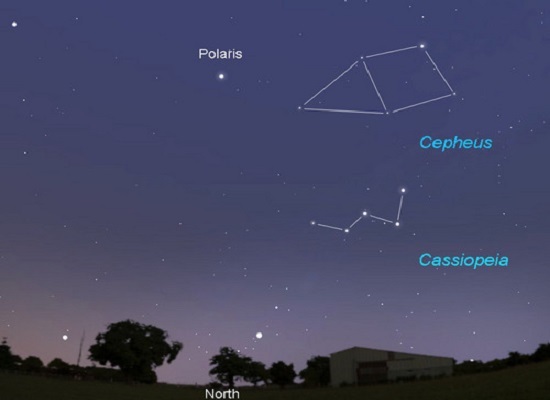 In short, Andromeda was the daughter of Cassiopeia and Cepheus. The issue was that at some point Cassiopeia became so arrogant that went ahead and claimed that she was more beautiful than the Nereids Nymphs. 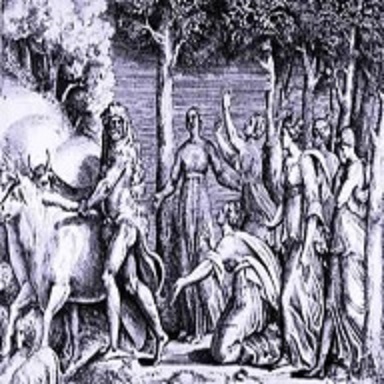 Hence, in order to atone for her mother’s sin, Andromeda had to be sacrificed to calm the nymphs’ rage (aka the 50 daughters of Nereus, a sea god). 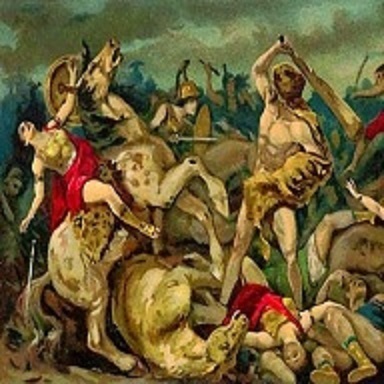 Consequently, our hero Perseus (some hints of who our hero was: Pegasus, Medusa...) came and saved the day (for more details about the myth click on the links below). 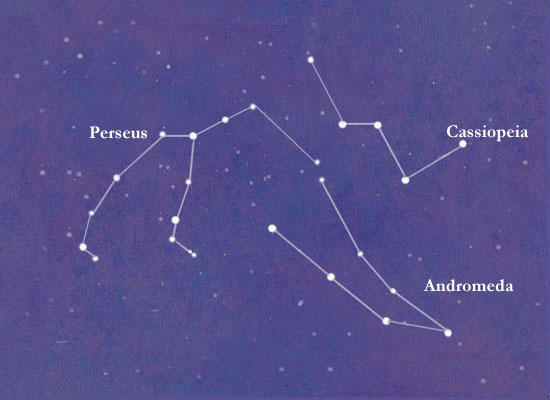 What is more, Perseus and Andromeda had 7 sons and 2 daughters and one of their sons was named Perses (not to be confused with the Titan god); so legend has it, Perses was the father of the Persian royal lineage (aka the Persian empire). In Greek: Πέρσης (Perses) – Πέρσες (the Persians). Experienced and deep-level researchers analyse Ancient Greek Mythology by usually combining level two and level three - layers. One variation of level three – layer also extends into the area which nowadays people term as alien conspiracy theories; nevertheless, for our present article we will not go into these areas. All that being said, and before we will start to analyse the secret messages of Hercules’ 12 labours, there is one more matter that needs to be addressed. The most famous of all Heroes from the Ancient Greek Mythology is no other than the hero Hercules (aka Herakles); son of Zeus and the mortal woman Alcmene. From an etymological standpoint the name Herakles stands for “the glory of Hera”. According to some researchers Zeus stands for the cosmos’ nous (mind - spirit) while Hera represents the cosmos’ soul; if you rearrange the letters of Hera’s name you get that she represents the matterless (consisting of no matter) essence that is the foundation of a human’s soul (in Greek: Ήρα becomes Αήρ). Prodicus (one of Socrates' possible teachers) states that at some point, once Hercules did complete his education as a teenager he was faced with a dilemma: to choose the path of vice (of backstabbing, of worldly titles and wealth, of injustice) or to choose the path of virtue (a difficult and steep path, full of adventures, that would eventuality lead him to immortality). Hercules chose the path of virtue! To make the long story short, the years passed by, and after freeing Thebes from ridiculous high tax oppressions from another city-state, he got married to Megara, daughter of Thebes' King. They had a happy family with three children. Nevertheless, Hera was mad at Zeus and this illegitimate child of his; and because she could do nothing against Zeus, Hera set her sights on Hercules. She drove him mad, and during his rage of madness Hercules killed his wife and children. Once he returned to normal and realized what he had done with his on bare hands he asked for council from an Oracle and its telling was: "the strongest shall serve the weakest" (some say it means: Hercules should serve the people). In any event, Hercules ended up serving Eurystheus, king of Argus, a man far inferior to Hercules. Eurystheus, and through a few interventions of Hera, ordered Hercules to complete his famous 12 labours; hoping that our hero would fail. 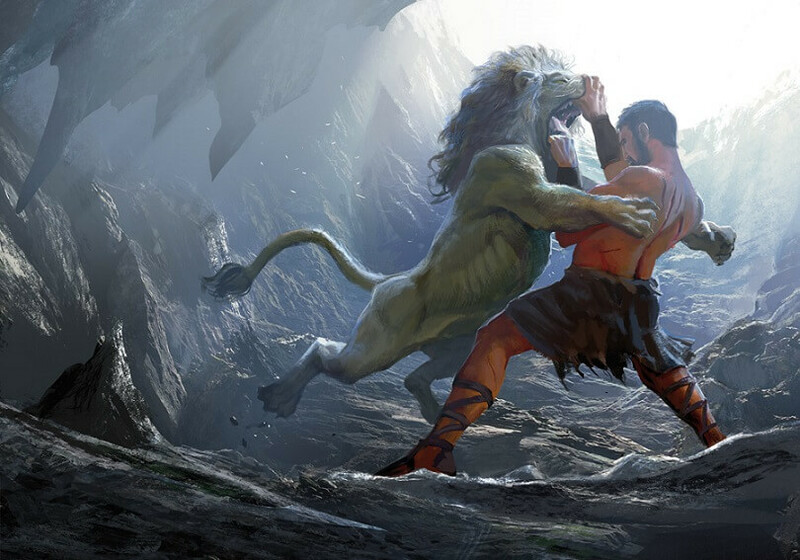 Labour 1: Slay the Nemean Lion. Killing the Nemea Lion symbolizes the victory of the brave man (Herakles) over the wild, the human’s animal instincts (lion), through the power of his mind (bat or club – you know, Hercules’ famous baseball bat that he was carrying around all the time), which represents the unshakeable soul’s strength (or willpower). Labour 2: Slay the nine-headed Lernaean Hydra. 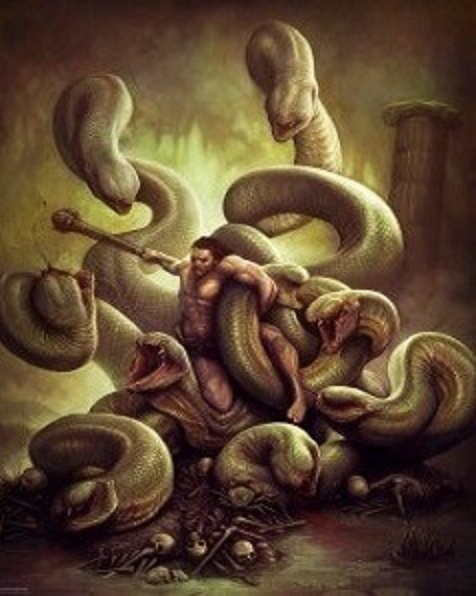 The nine-headed Lernaean Hydra symbolizes the monster/darkness inside of us, the numerous of (earthly) desires with which we have chained ourselves and that arise due to our ego (represented by the Hydra’s body). Consequently, we need to behead them (kill our desires) and burn them with “fire” (the fire of our spirit/mind), a symbol of catharsis (aka purification or cleansing). Labour 3: Capture the Ceryneian Hind. The golden horns symbolize higher knowledge. The hind, in general, represents the disorderly character of man, the man’s ego that runs wild and uncontrolled everywhere, but is captured by Hercules (the brave warrior soul) and is been tamed in the end. Consequently, man is freed from his shackles and thus, is now able to use his ego in a honourable manner; attaining spiritual purity. Labour 4: Capture the Erymanthian Boar. The Erymanthian Boar symbolizes the delusions of personal interests. Due to extreme self-interests, man becomes an aggressive boar, which hurts its physical environment (represented by nature, crops, plants and animals) as well as hurting the people around him (aka human society). The tusks symbolize the underhanded or illegal means, which are used so as for man to accomplish his goals; based on self-interest. 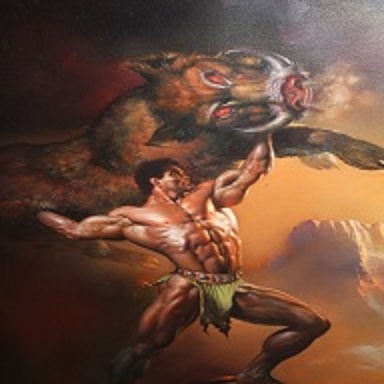 The Capture of the Erymanthian Boar by Hercules symbolizes the control over our self-interests and the development of collectivity for the greater good (in other terms, being a team-player rather than a self-centred egopath). Labour 5: Clean the Augean stables in a single day. The ordure of Augean symbolizes the corruption of an entire society, the political corruption that for ages misuses its power against its people (does, all of this, ring a bell to you guys?). It’s the sinful age of Pisces, an era that has brought to humanity: slavery, the dark ages, human exploitation and the levelling of society’s values as well as the levelling of ethical values. The two rivers that Hercules uses to clean the stables, with their water, symbolize the water’s cleansing characteristic / ability ( remember: water in the occult also symbolizes the soul). The rivers' water will wash away the spiritual and mental impurities (including the washing away of the peoples' falsely general accepted beliefs) and will bring forth the awakening of human awareness. 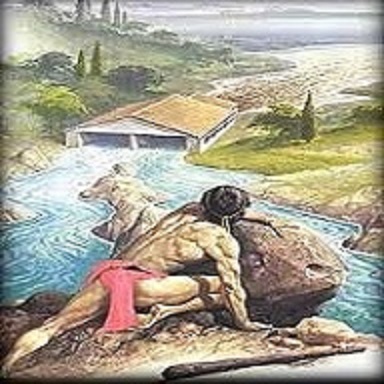 Hercules symbolizes the power that opens the path for the new age of Aquarius. The constellation of Aquarius is the new domineering power of our new era that is on the rise and draws its power from water; and according to Thales of Miletus, water is the prime basis of creation. Labour 6: Slay the Stymphalian Birds. 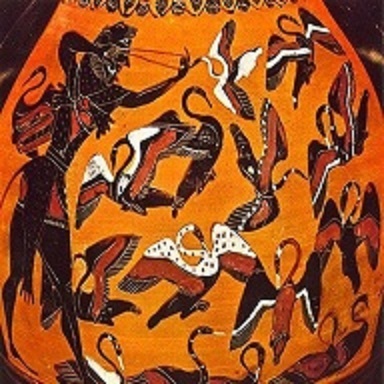 The Stymphalian Birds symbolize our character’s lowest aspects such as jealousy, vice, selfishness, ungratefulness, pettiness. The rattle that Athena gave to Hercules, created by Hephaestus, represents the profound knowledge that will aid us in hitting our mark (symbolized by Hercules’ bow and arrows). In other terms, man will be able to slay his inner demons that eat away at his soul. Labour 7: Capture the Cretan Bull. The unrestrained bull symbolizes our uncontrolled passions. 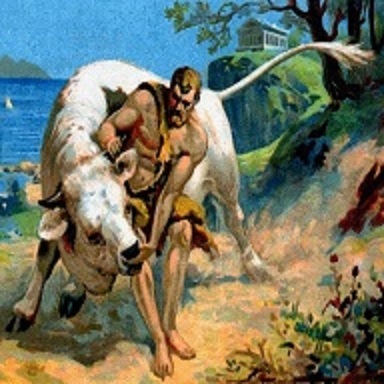 Taming the bull symbolizes the taming of, and taking control over, our passions, especially over our sexual drives; hence, man is able to acquire the soul quality of self-discipline. Please Note: Either uncontrolled passions, in the form of debauchery, or oppressed passions are harmful to man; the point of this labour is to be able to balance out both sites and to “stand” in the middle of the scale. 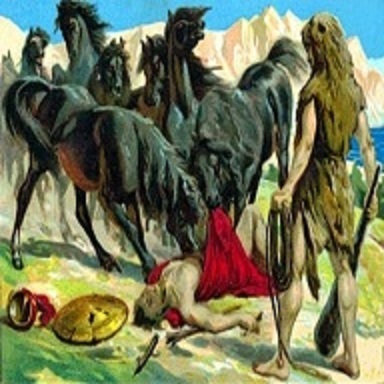 Labour 8: Steal the Mares of Diomedes. Generally, horses symbolize the human mind. The young mares illustrate the female side of our mind, which is responsible for the birth and conception of ideas (aka the artistic side of our mind). Moreover, the mares stand for: either the tendency to adopt thoughts that are destructive, when arising from our lower self (symbolized by the black horse), or constructive when arising from our higher self (symbolized by the white horse). Remember the White and Black Wolves that the Shamans make reference to? In sum, the Mares of Diomedes refer to the fact that if inside man, untamed enthusiasm and impulsiveness is allowed to rise, due to success in life, the birth of an egocentric personality is imminent; something that we need to tame with the prudence of our personality (aka the strengthening our character). Labour 9: Obtain the girdle of Hippolyta, Queen of the Amazons. The girdle of Hippolyta symbolizes the power of the Amazon kingdom. The abolition of the Amazon demonstrates the ending of the Matriarchal rulership, not only for the Amazons, but for other populations as well (hence, entering the age of Pisces). Labour 10: Obtain the cattle of the monster Geryon. The red cattle symbolize our secret desires, focused on materialism (for example an expensive car, worldly titles and so forth); desires for which we are willing to do anything in order to achieve them, even if that means to neglect the needs of our spirit and soul. In essence it refers to the constellation of Pisces and Pisces era, a gloomy period in human history with only a few sparks of light. Pisces era was mostly domineered by scientific advancements that were serving dark forces that carried out wars to conquer, enslaved people and nations, destroyed cultures and our environment; with the sole purpose to increase wealth and to attain materialism. 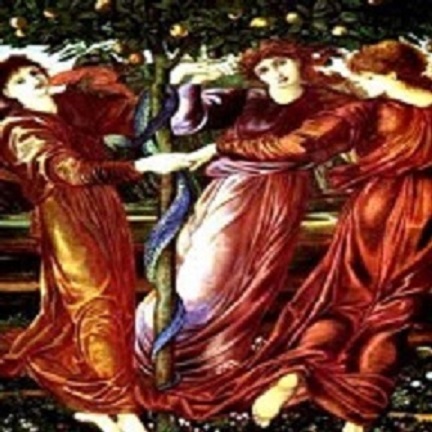 Labour 11: Steal the (golden) apples of the Hesperides. In general apples symbolize knowledge and the golden apples symbolize the higher knowledge, the truth that makes the human being, complete (interestingly this labour contradicts the Bible's passage in which the "devil" gives Eve the forbidden apple of knowledge; we will write an article about it soon). Nevertheless, only a few can attain this higher knowledge; and these few must possess a heroic soul (Hercules) that is capable of putting the dragon to sleep (without killing him). Once man possesses the apples of the Hesperides, the higher knowledge, represented by the golden apples, is transferring its godly properties to the heroic soul. The dragon and the nymphs symbolize the guardians of that knowledge; and they do not allow the uninitiated ones to claim it and misuse it against humanity. The fire that Prometheus gave to some people, who were not ready yet, in essence symbolizes the forbidden knowledge; a knowledge that was misused by its wielders, Ancient High-Tech World Wars occurred, which in turn lead to biblical catastrophes. And that is exactly why Zeus punished Prometheus. Labour 12: Capture and bring back Cerberus. 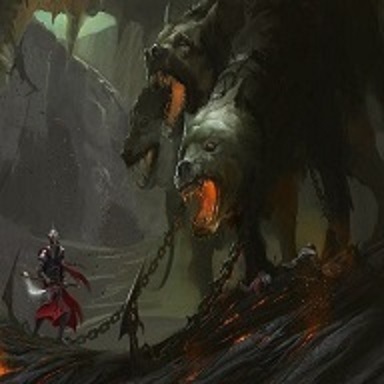 The secret message: Cerberus and catharsis: The world does not change, if we do not change ourselves first! Cerberus symbolizes the atrocious monster that we have within us, which keeps our soul imprisoned in the dark (Hades) and does not allow the soul to be free. Hercules, the glorious and brave soul, captures Cerberus, with the aid of Athena (the manifestation of wisdom and knowledge), and brings Cerberus to the open light. The descent of Hercules to the Underworld symbolizes the initiation of the Hero (many occult schools, if not all – Masons included, use that approach; namely, guiding the occult student from the darkness into the light). In this regard, Hercules becomes a mystic (aka esoteric enlightened). To do so, he needs to go through all his previous labours so as to reach his Acropolis of Knowledge, the higher knowledge through “Know Thyself” (aka self-awareness). In this respect, man rises from ignorance to ethical knowledge. Then, man becomes spiritual enlightened and the catharsis of his soul is achieved; and all of this leads man to his final destination: to salvation and to deification (as it happened with Hercules). This final step is the ultimate revolution we can accomplish in the world that we are living in. The glorious victory over our own selves: the revolution of consciousness, the revolution of the mind. Changing ourselves, our evil self, we will be able to gradually change our surroundings as well; and in the long run the whole world. It is a grave mistake to try to change the world without, first, trying to change ourselves. The world does not change but what changes, is us which in turn will lead the world to change. 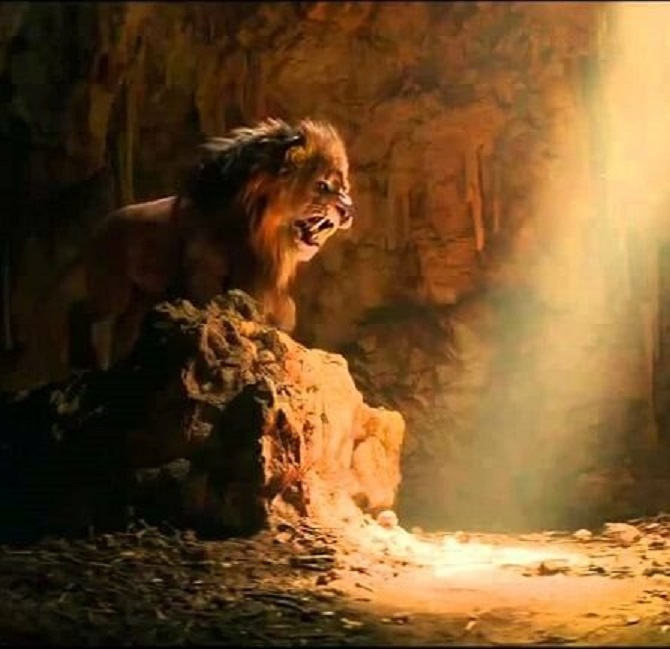 Hercules, with the help of his physical strength and the experiential knowledge gained from his travels, and labours, attained the catharsis of his soul; he was able to claim redemption and free himself from every temptations and desires that were chaining him down inside Plato’s Cave. We may not become as physical strong as Hercules was, but we surely can – if we wish so, attain something of Hercules’ soul and spiritual faculties. For all the aforementioned reasons, it can safely be suggested that, Hercules represents the perfect symbol of the human archetype. What do you think about The Secret Messages of Hercules' 12 Labours?